Cypress is a beautiful, distinctive and durable wood that assures years of trouble-free satisfaction. It has a natural preservative oil known as cypressene, which gives the wood natural resistance to insects and decay. 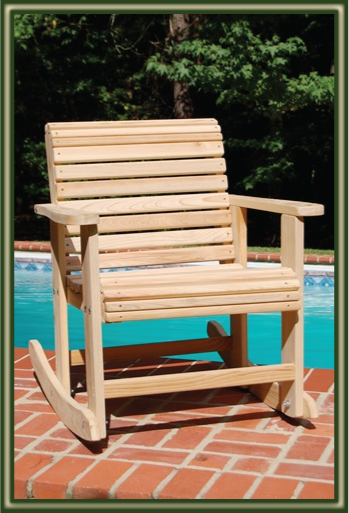 This Cypress Rollback Rocking Chair features a rolled front and back for less irritation and a contoured seat for extra comfort. As with all Cypress Moon Furniture, price includes FREE SHIPPING! WHY CHOOSE CYPRESS? Cypress wood is nicknamed as the "eternal wood". Cypress has a strong tolerance to environmental elements and has been known as the world's 'wood of choice' for thousands of years. Very few woods match the properties of cypress when it comes to sturdiness and strength. Cypress wood can be easily identified by its handsome, straight grain that portrays a gorgeous array of colors. This unmatchable beauty is enhanced by life long durability. Cypress wood is naturally decay and insect resistant and continues to be rated as the most durable wood in America. It has little tendency to warp, twist, or cup. It even matches up to teak wood in outdoor performance, yet cost sometimes 10 times less. Because of its beauty, natural durability, and broad versatility, cypress' popularity continues today! FREE SHIPPING! - within the 48 continuous United States.